ST01 is a high quality temperature sensor that is specifically designed for soil temperature measurement in extreme environments. Using top quality materials it is suitable for hostile conditions as encountered in outdoor installation (temperature, radiation, chemicals). It is designed to have a record-breaking lifetime with optimal stability. Employing a platinum sensor, at extreme temperatures a higher accuracy can be attained than with commonly used thermistors. The measurement of soil temperature is recommended by the World Meteorological Organisation at depths of 5, 10, 20, 50 and 100 cm. Proper installation of soil temperature sensors requires a lot of effort. Once installed, sensors are usually left alone without calibration for a long time. This means that the sensor and cabling should be very reliable and stable over time. ST01 is designed to be an ultra-stable sensor that can withstand the extreme conditions met in meteorological use; partially sub-soil, partially above-soil installation. 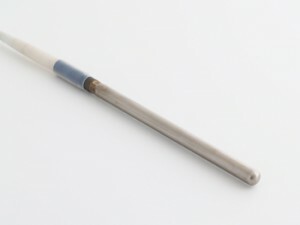 The ST01 cable as well as the sensor itself can be used across a very wide temperature range. The usual weak points of cabling have been eliminated; ST01 has a high resistance to the combination of high moisture & radiation and does not crack when bended at low temperatures. The needle and cable are resistant to virtually all chemicals, oils and fluids. The preference for Pt elements is because of their excellent stability (as opposed to thermistors that are known to behave unstably in case of thermal shock and exposure to temperatures higher than 80 degrees). Also the linearity of the Pt elements is such that the initial acuracy at extreme temperatures is much better than that of thermistor based sensors; + / - 0.25 °C between -50 and +50 °C. A one-point calibration in ice is usually sufficient as general quality assurance and to increase the accuracy to +/- 0.15 °C.